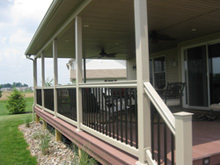 All of our aluminum deck railing options, vinyl fencing supplies, decking lumber, specialty products, and porch railing parts are manufactured using only some of the best materials available. Because of this, our customers can be confidendent and satisfied with the outdoor fencing materials in Lebanon, Lancaster, Reading and surrounding PA counties. . The Morgan aluminum fence system is manufactured of the highest quality aluminum and all parts of the system are powder coated for durability. The series has a "no screw" assembly process for residential, pool and commercial properties and is designed to keep its attractive appearance for years. It is shipped in pre-assembled sections for your convenience. The Morgan Aluminum Fence System consists of two series: 2000 and 4000. The 2000 Series is recommended for residential installations and is constructed in six foot assembled sections, in various sizes. Hidden picket fasteners (patent pending) produce a clean, smooth profile and gates are available for each style. Optional are three finial choices, short pickets and ring assembly, shown on the following pages. 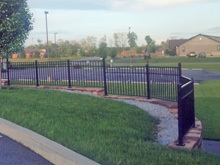 The 4000 Series is intended for commercial and heavy duty residential installations by professional fencing companies. Constructed in eight foot assembled sections, the 4000 Series comes in a variety of styles with matching gates. Designed with heavy posts and pickets with hidden fasteners for a clean appearance, every fence installation has a professional look. Special options for the 4000 Series include three finial choices, short pickets and ring assembly. Arch top gates are available in all styles. No fencing job is too big or small. Contact us for a FREE quote!